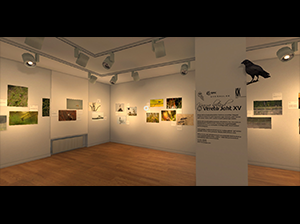 Take a look at the virtual exhibition. The “Non-Bloody Hunt” virtual exhibition project was very similar to the digitization process described in the previous section. In addition, we also created a special showpiece for the exhibition. In order to give the showpiece some extra value, we animated a virtual stuffed figure. Visitors can explore it via a 3D television set with special glasses. The animated flying raven livens up a static exhibition and adds movement.